Ryan and Lacy Orabutt of Minonk are pleased to announce the birth of their daughter, Sophia Sue Orabutt. Sophia was born January 2, 2007, at 5:16 p.m. at BroMenn Regional Medical Center, Normal. She weighed 5 pounds 15 ounces and was 18 inches long. She was welcomed home by her big sister Olivia, 2. Grandparents are Larry and Karen Schmitt of Tonica; Randy and Gayla Tate of DeWitt; Martha Orabutt of Dana and Jim Orabutt of Itasca. Great-grandparents are Esther Gauger of Minonk; Delbert and Evalyn Tate of Jonesboro, AK; Marie Schmitt of Ottawa and Lorin and Jane Hallenbeck of Downers Grove. Click here for photo. 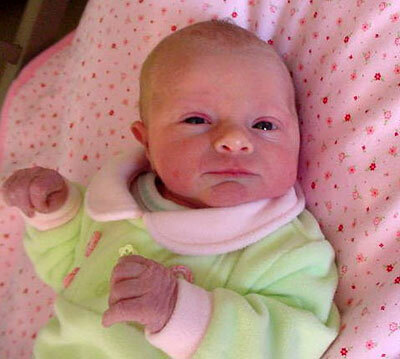 Madelyn Josephine Carver arrived on Monday January 8, 2007 at 1:12 p.m. She was 8 pounds, 6 ounces and 21 inches long. Angela and Madelyn returned home on Tuesday afternoon and are doing very well. Big sister Samantha (almost 2) is adjusting well and likes to look at and hold Madelyn. Alyssa Leann McDaniels was born to Michael and Jenny McDaniels on June 29th, 2007 at Bromenn in Bloomington. She weighed 8lbs. 5oz. and measured 20 inches long. She was welcomed home by big brother Jordan. Grandparents are Peggy Ponce and Bill Pingle of Minonk. Cheryl and Kevin Wolfe of Secor and Mike McDaniels of Amarillo, Texas. Mike and Staci Blew of Lake Wildwood are proud to announce the birth of their third son Colten Alan Blew. Colten was born July 5th,2007 @ 7:30am @ Bromenn Hospital In Normal He weighed 6lbs and 4oz and 18 1/2 inches long. He was welcomed home by big brothers Caleb 51/2 and Caden 31/2. Maternal grandparents are Dean Knack and the late Nancy Knack. Paternal grandparents are the late Ted and Earlene Blew.